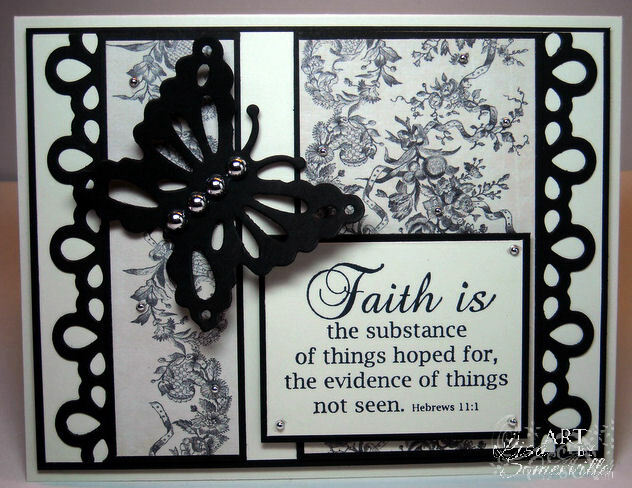 The beautiful papers are from Webster's Pages, I rotated the sketch and and added the butterfly that I cut from a Black a panel using the Decorative Butterfly Border. The border edge is from this same die. The sentiment can be found here. What a beautiful card, Lisa! 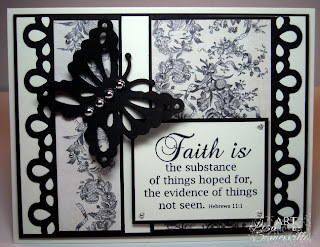 Stunning butterfly card and the sentiment is very inspiring! You created a beautiful piece with those dies and stamps! This card is absolutely gorgeous!!!! WOWZer that is one gorgeous card! Love the design, paper and sentiment! What a fabulous card - I just love it! Lisa, this is so unbelievably beautiful. I love your work and come here every chance I get. Thank you for being a huge inspiration to me. Gorgeous, love the black & white and that butterfly is gorgeous!!! Love the look of this card Lisa! The black and white is just gorgeous. THis is so ELEGANT and BEAUTIFUL! Lisa, I am putting this up at the top of my favorite cards you have made, without color. I love the bg dp! And, the sketch was used brilliantly. I love that large butterfuly and the border is gorgeous. I love the Scripture, of course! Fabulous! Eye catching and clean cut, love it! This card is so beautifully elegant.